The Star Light Star Bright Bath Melt is a Lush golden oldie that has made a return to all stores for 2017’s Winter line. Last year several Lush products received face lifts, the most noticeable being the Shoot for the Stars bath bomb. This year Star Light Star Bright was the product to be tweaked. In store you cannot see any obvious differences between the old and new versions. When you however use it, its alterations become crystal clear. Unfortunately I never had the pleasure of using the previous version so I can only compare from other people’s photographs. Even without these photographs I have heard no negative feedback in regards to how it has been altered at all, I therefore feel safe in saying that it’s an improvement. Star Light Star Bright is one of the largest of the Lush bath melts that I have tried, seeing as I haven’t ever been very keen on the Snow Angel bath melt I was really pleased to see an alternative larger bath melt included in this years regular Winter line. 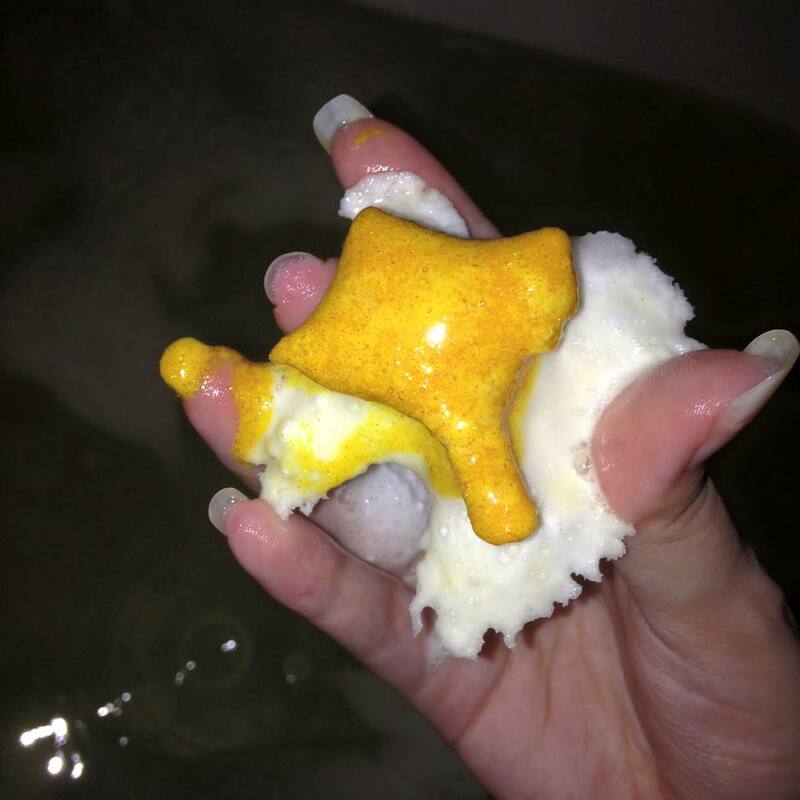 The Star Light Star Bright bath melt is exactly the same size as the Stardust bath bomb, I’m sad this bath bomb didn’t make a return this year, Star Light Star Bright has however helped fill the void its absence has left. As Lush bath melts go, Star Light Star Bright is rather heavy, sadly some of the ones I have used have been sinkers, others have however worked well. Even the sinkers create some of the prettiest bath art when held at the water surface. Ideally I’d love for them all to float as holding them is a lot more effort than I’d like to exert when attempting to take a relaxing bath, the bath art is however worth it. 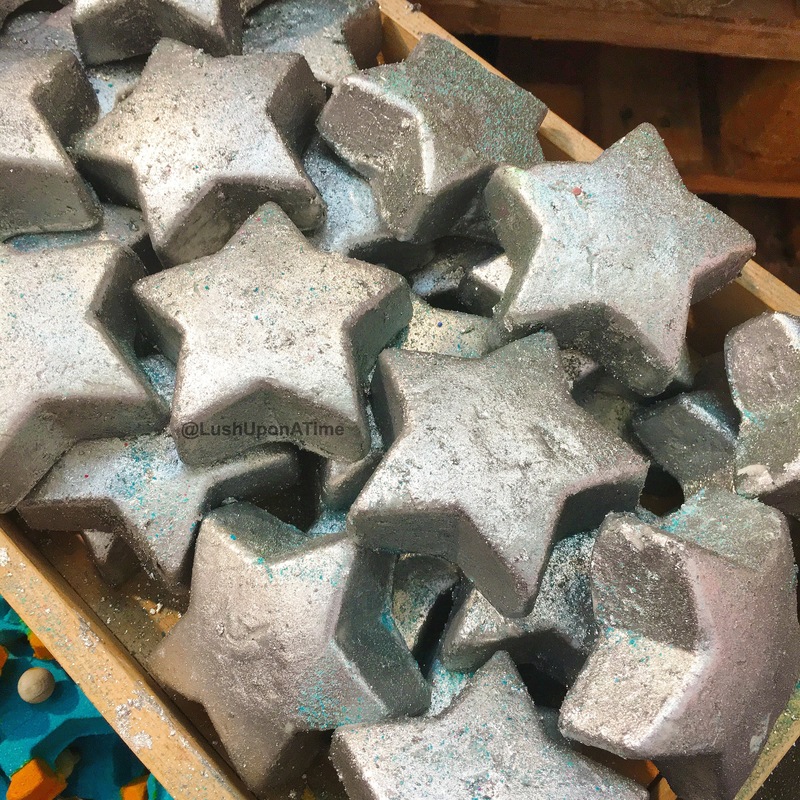 As soon as the Star Light Star Bright bath melt comes into contact with the water its coat of biodegradable, silver-lustre begins to float off of the bath melt revealing a plain white star. As this goes on, the bath water becomes decorated with the most beautiful, silver shimmer leaving you feeling like the nights sky. 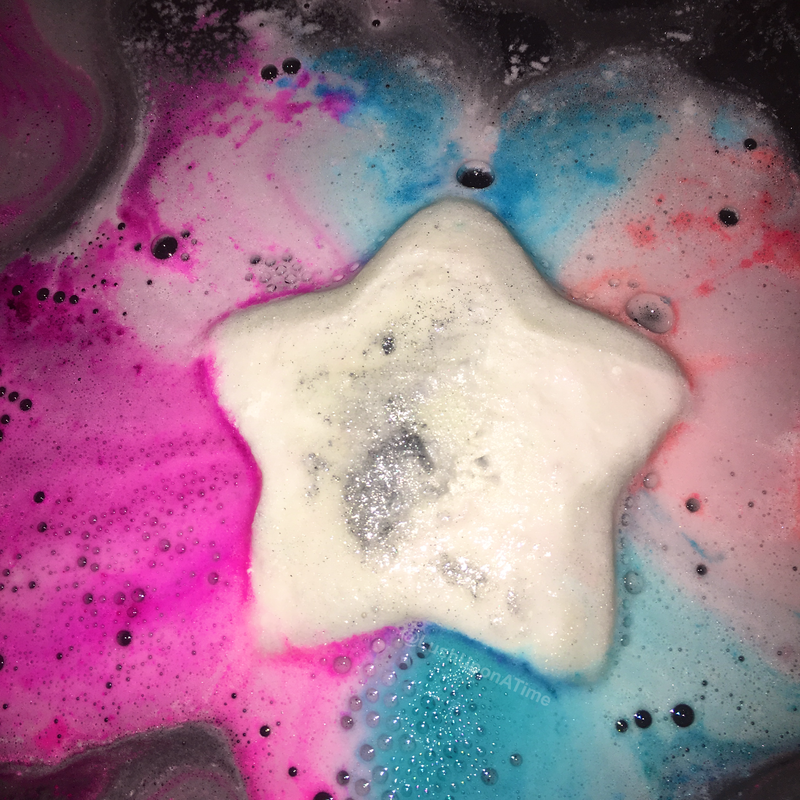 Star Light Star Bright is often mistaken for a bath bomb, this is because of its larger size and also because of its performance in the bath. Upon first use, once the silver lustre had separated from the melt I thought that, that was the end of this products show. Then an explosion of colour burst out of it. Most of the bath melts I have used previous to this have never created so much colour and beautiful bath art. Normally I find that the melts just melt away, leaving hardly any colour at all, for this reason I would say that Star Light Star Bright is truly one of a kind. This bath melt is also perfect for winter battered skin, it makes the water so soft and hydrating with its murumuru butter, when the colours erupt from it, it shows a variety of colours reminiscent of the Roller bath bomb, both for the pretty patterns and its colours. Scent wise, Star Light Star Bright is one of the more subtle scented products available in this years winter range. Containing ginger, lime and lavender oil I expected it to have more of a kick. It’s lighter scent however works very well with me, sometimes its nice to try a lighter scent. If you’re lucky enough to purchase A Star Light Star Bright bath melt that doesn’t sink then you’re in for one of the prettiest baths Lush have created to date. Sinker or not, the hydrating qualities of this melt are spot-on. The colourful show it puts on (if it does stay afloat) makes this bath melt worth every penny too. I’ll finish this review off with a photograph I took of the water once the bath melt had dissolved, it creates one of the prettiest baths I have ever had the pleasure of soaking in. Lush bath melts and oils are still a fairly uncharted territory for me, I need help getting in and out of the bath because of my bad joints and adding something that could potentially make the bath more slippery is an accident waiting to happen. I have however been getting on fine with the bath bombs that have half of them dipped in oil; The Roller, Never Mind the Ballistics and Over and Over have actually become some of my favourite Lush products. Using those 3 bath bombs gave me the confidence to start trying Lush bath melts and so far I’ve been perfectly safe in the capable hands of my bath! The Two Hearts Beating as One Bath Melt is brand new for 2017. 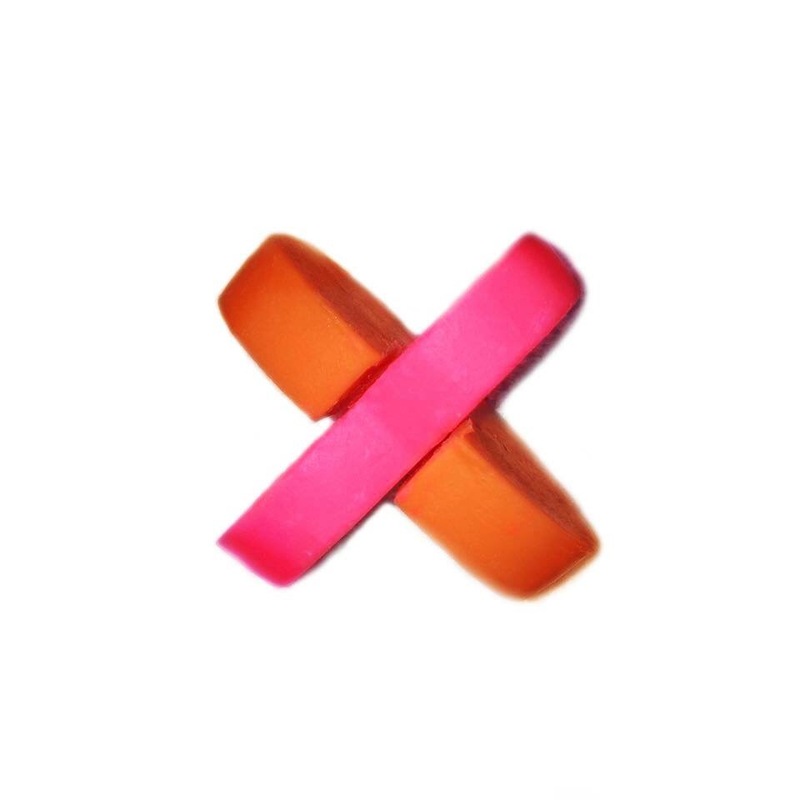 It is a part of the amazing Valentine’s Day range this year and has proven very popular. 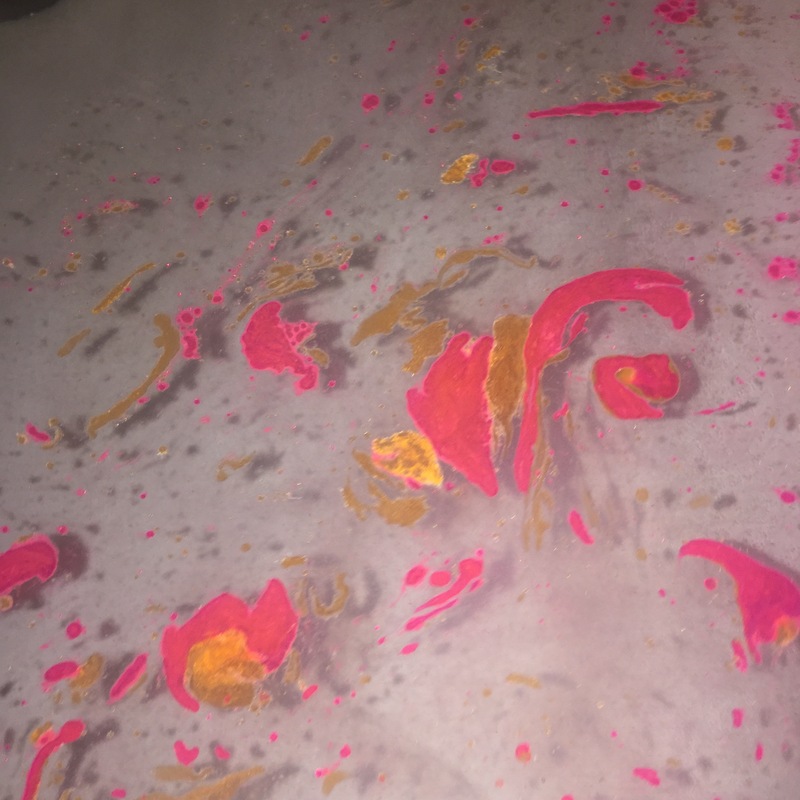 If you look at the photos of the bath melt above you can see that it is made of 2 heart shaped melts, one pink and one orange. What first surprised me is how ungreasy it was. You’d expect a bath melt of its size to make you slip around like a seal on ice but it wasn’t like that at all. It was the perfect quantity. My skin felt moisturised but not too over moisturised, it was a lot better than I had expected. Two Hearts Beating as One has a floral and sweet fragrance, the ylang ylang, apricot and rose oils are probably the most noticeable of its ingredients scent wise. Like the Butterball bath bomb, Two Hearts Beating as One is best used in a hot as you can stand it bath. 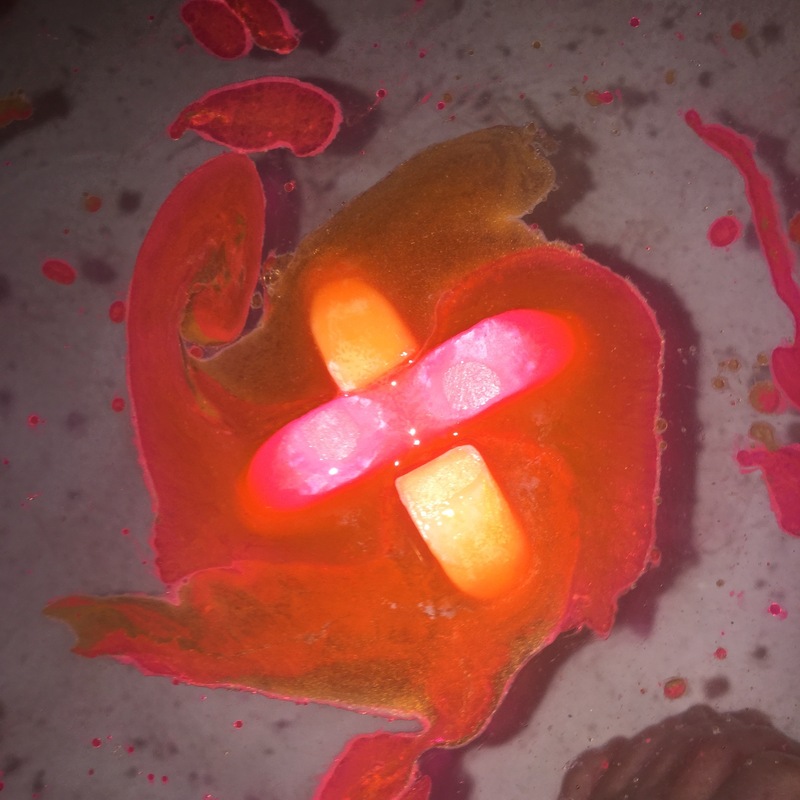 Once put in the bath water the Two Hearts bath melt floats, dancing around slowly creating pink and orange swirls of oil. My Winter battered skin was very pleased with this bath melt. It left my skin feeling soft and silky smooth from top to toe. I really wasn’t expecting myself to like this bath melt as much as I did. I will be buying a couple more before the Valentine season is over. A trick I have learnt about the oilier bath products from Lush is to always have a bottle of Fairy Liquid near by, a quick squidge of that on a sponge wipes any excess oil away with minimum effort. It’s the perfect solution for those that moan they don’t want to scrub out a bath straight after using it. Some people would be really pleased to hear my fairy liquid trick, especially those sitting on the fence about becoming a Lushie so I thought I’d add it to this review. A quick wipe around the tub before you get out helps so much, I always recommend giving the bath tub a quick hose down after you use it anyway, (Lush bath or not) I just like to rinse away the dead skin cells left behind after a bath. Why would you want them hanging around?! I am however a clean freak so I know not everyone does this after every bath. I honestly had no problems with this particular product mess wise though. I never have with Lush. Slowly but surely I have been working my way through all of the winter 2015 Lush products. Today I’d like to introduce you to the Yog Nog Bath Bomb. As you can see from the above picture, Yog Nog is a very unique looking bath bomb. It really is like no other. It has the most beautiful exterior, instead of it just being the standard smooth bath bomb it has lots of little Christmas shapes all around it. Lush have stated that Yog Nog is ‘sweeter than dipping into your biscuit tin,’ which I know has left a lot of people intrigued. If you’re a frequent reader of my blog you’ll know that the ‘sweet products’ although very popular, are not always my favourite. Curiosity however took over and as soon as the 2015 Winter line became available online I ordered myself one to try. Upon first sniff I was surprised at how much I actually did like the scent of the Yog Nog bath bomb. Sweet things and I do not always have the best relationship. For this reason I was a little worried that I wouldn’t like it. Being honest, I can’t even eat sweet things, I struggle after just two bites of a Kit Kat Chunky. Although the Yog Nog bath bomb is sweet, there is definitely a note of spiciness within it. I think that this is the Yog Nog bath bombs saving grace with me, without that small splash of spice I don’t think I’d have been as keen of it as I was. The Yog Nog bath bomb’s scent is compared to cinder toffee which makes it a great choice for a Christmas present for anyone with a super, sweet tooth. 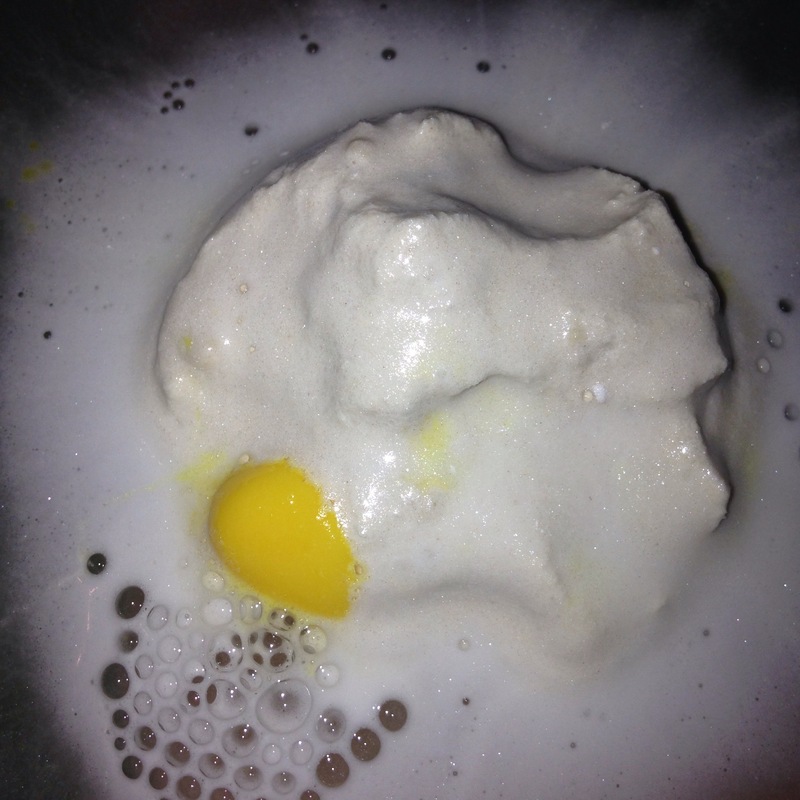 Upon coming in contact with the water, the Yog Nog bath bomb fizzes yellow and white. As Yog Nog’s solid shell dissolves away you start to notice that it has several lumps of soft, buttery, bath melt hidden inside. A Yog Nog bath left my skin beautifully smooth, soft and moisturised. It hydrated my winter battered, dry skin perfectly. What made it really special was that the scent of it stayed with me on my skin, throughout the rest of the day. I found this bath bomb very relaxing, the only thing I disliked about it was how much oil it left around my bath tub. Although it was amazing for hydrating my skin it made the tub very slippery which is a little dangerous for me in particular as I am not at all stable on my feet due to EDS. When getting in and out of the bath I had to be very careful but in all honesty I always do so in hindsight it wasn’t a bad trait. Most Lush bath bomb products wash off of your bathtub with a quick splash of hot water from the shower head, Yog Nog however needed a little bit of help, a dab of fairy liquid followed by the shower head removed it just fine. When you use a Lush product that is a little more hydrating than others, fairy liquid is actually the perfect thing to remove the excess oil left behind as it cuts through grease etc. It doesn’t only just work on dishes and cutlery but is also a very handy bathroom cleaner too! I thoroughly enjoyed the Yog Nog bath bomb and I put it in amongst my other favourites Stardust, So White and Luxury Lush Pud. The good news is they actually have a Yog Nog Soap and after Lush sent me a sample I ordered a great big bar of it, it smells so, so good! The Snow Angel although primarily a bath melt could in my opinion also be considered as part bath bomb because of how solid and robust it is. It doesn’t instantly start to melt in your hands in the same way as other Lush bath melts do either. Upon first glance of Snow Angel you immediately notice how big it is. I had seen it online several times before actually getting hold of one and I can remember how surprised I was with its generous size. It is in the shape of an angel and its front is white with speckles of gold shimmer, the other side of the bath melt is a sparkly gold. Before I got so heavily into Lush products I used to avoid all of their products with glitter as the thought terrified me. I am so glad that I learnt that there is in fact nothing to be afraid of when it comes down to the products with shimmer in. They are not messy at all, I always describe it as ‘cosmetic shimmer’ as I find it similar to make up that has a slight shimmer to it. It’s honestly not a one way trip to glitter-hell! 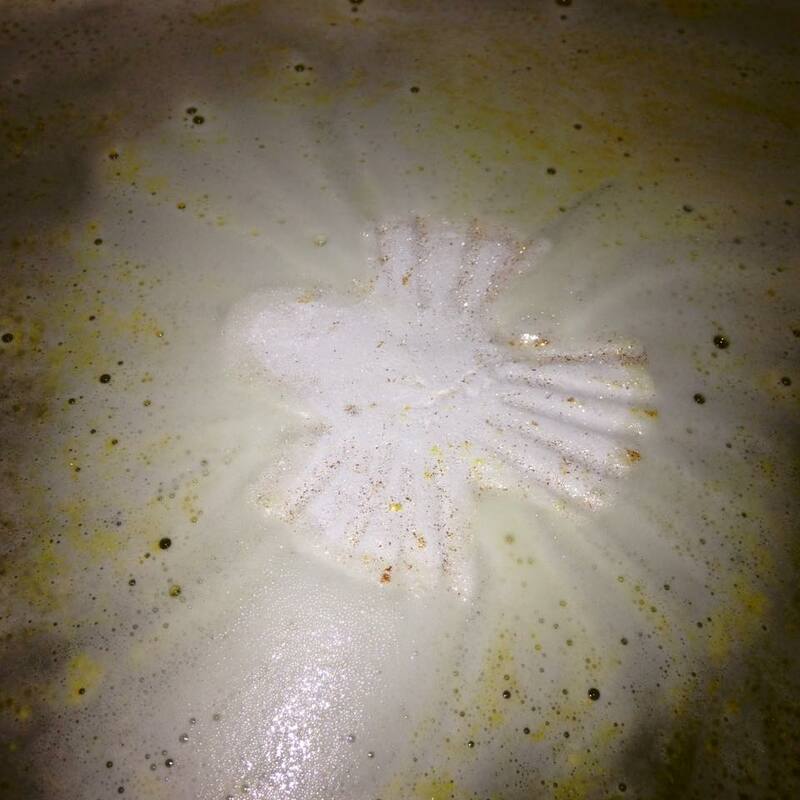 Upon hitting the water Snow Angel’s gold shimmer spreads out, as does white foam. The sweet yet delicate scent of marzipan instantly fills the room as the Snow Angel floats gracefully around your bath. As Snow Angel slowly melts away the water becomes a glorious, butter-yellow, it is at this point that your skin starts to benefit from the super-moisturising hidden ingredient, soft, organic cocoa butter. This bath melt helped soothe my dry, winter battered skin and left my skin so soft. The next day I could still feel the benefits of the Cocoa Butter, my skin was still positively glowing from the previous days good-old-soak. You will most certainly always get out of a Snow Angel bath with the most radiantly moisturised skin. I personally wasn’t a huge fan of its scent, I have however never been much of a marzipan person so my dislike of its scent was inevitable. Snow Angel’s ability to hydrate and moisturise my skin was definitely the highlight of using this product, for that sole purpose I would one-hundred-percent recommend it.